If you’ve ever wanted a sneak peek behind the curtain to see why and how your Microsoft Dynamics® GP software has the features that it has at each release, then check out this short video posted on MSDN Blogs called “An Inside Look with Chad Sogge”. Chad Sogge, Principal Group Program Manager of Microsoft Dynamics GP is in charge of setting the product direction for each GP release. This is a detailed process with a long term strategy in place, but mostly, they focus on the business need to create the features that meet those needs for GP customers. A lot of research and planning goes into each new release of Microsoft Dynamics GP and Sogge relies on input from real users. Using Microsoft Connect, real customers can submit ideas for software functionality improvement and bug corrections. Sogge and his product team look for customer pain points and try to design features that address real business needs. Since not every suggestion can result in a software improvement, Sogge uses a weighted system to determine which improvements are likely to have the greatest benefit to the greatest users, and then begins to plan out those software changes over a 3-5 year plan. Significant changes might require a phased approach over several upgrades. Simpler changes and bug fixes might be easier to implement with each upgrade. Sogge’s team is currently working on adding integration with Silverlight, SQL, Office and Outlook, and Web Client for the next major release – Microsoft Dynamics GP 12. Microsoft wants to hear from real customers so they can design features in their software that address real-life situations. 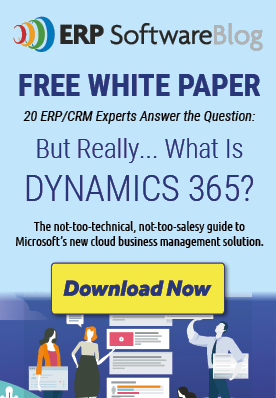 If you have suggestions for improving your Microsoft Dynamics GP experience, then tell Microsoft at their Connect website. Microsoft Dynamics GP is a popular business management solution that can manage finances, supply chain, manufacturing, project and services management, and other business operations. This powerful software can streamline operations, improve productivity, and improve profitability. Contact Sherwood Systems for additional details about Microsoft Dynamics GP or upcoming updates. My Ten Favorite Financial & Reporting Features in Microsoft Dynamics GP 2010 … How Many Are You Using Today?